As you may have read on my top three travel essentials post, I absolutely love Osprey packs and will be soon purchasing my third one. Osprey really makes the best travel backpacks! Here, I’m reviewing one of the Farpoint Osprey Packs. The first Farpoint Osprey Packs I used was the Osprey Aura 65 which I took on a 9 month Round-the-World trip and also to travel for 6 months in Central America. Roomy yet not too big for my 5’2” frame, it had plenty of space for all my belonging and all the souvenirs I picked up along the way. Despite the fact that I hardly ever used a backpack rain cover and put the bag through hell, it’s still in great condition and never failed me. After experiencing the quality and durability of this bag, I decided that when purchasing my next travel bag I had to stick with Farpoint Osprey Packs. This main compartment is a 40L backpack and it attaches to a 15L detachable day pack for a total space of 55L. When using the two items separately, the two pieces work perfectly for carryon air travel. I’ve used it on several international airlines with no problems. While I do check my bag in when I don’t feel like carrying it, having a bag that’s carryon size helps streamline the packing process and encourages me to take only the travel necessities. The bag comes in two sizes which makes a huge difference when it comes to comfort! At just over 5 feet tall, I use the small/medium which fits very well with my stature. Remember, just because you’re taller doesn’t mean you need a bigger bag. This is just the right size for your belongings – choose the medium/large size for a good fit. As with the Osprey Aura 65, the nylon fabric is easy to clean and doesn’t look dirty. It fabric feels rugged and doesn’t tear easily. The zippers are sturdy even when I stuff the bag beyond its abilities. Osprey packs are built to last which is exactly what you need when you depend on a travel bag to act as a home for your all your belongings on a long backpacking trip. Farpoint Osprey packs only weighs 2 lb. which makes them very lightweight bags despite its quality materials. It’s great to be able to have a daypack you can attach to your backpack and avoid walking around like a “pregnant turtle”. When you want to use it during the day, zip it off and go! It’s very spacious and opens like a suitcase allowing you to organize efficiently and not struggle to find your belongings like you would with a top loader. As a long term traveler, it fits my Maximista Packing List amount of clothing perfectly when using my Compass Rose Packing Cube Set which I use as my preferred travel organizers. It also has compression straps on the exterior of the bag which helps make sure your Osprey pack will fit into any airplane overhead compartment and it also minimizes the bulkiness of the bag on your back. 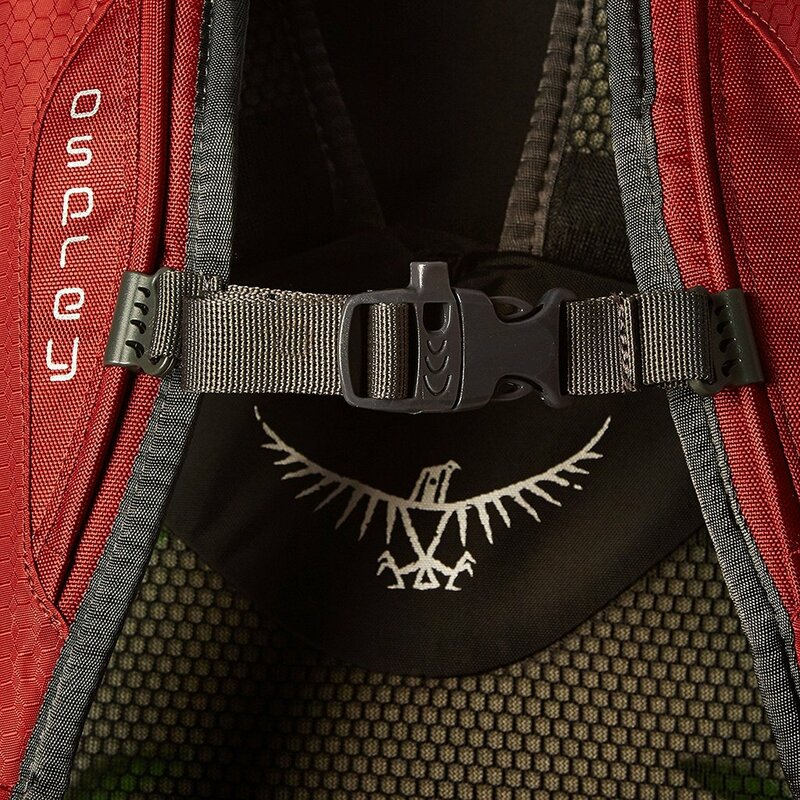 One of the best features of the Farpoint Osprey is that it has lockable zippers which actually did prevent a theft last year in a Borneo hostel. Most theft is due to convenience and ultimately, if someone’s going to take your bag or break into it; it’s gonna happen no matter what. The majority of people traveling with a backpack are most likely staying in smaller guesthouses and hostels. Usually, you can leave your backpack in your hostel dorm without much concern. While some hostels do have lockers for your bag, many don’t but they do offer services to store your valuables in either individual safes or with reception. Don’t be alarmed, though. Out of the 5 years I’ve been on the road, I’ve only had something taken out of my bag once while traveling at a hostel in Cape Town so it’s not a common occurrence, plus it was really my fault for leaving cash in my unlocked Osprey Aura 65 bag. I feel very secure with the Farpoint Osprey 55. I do wish the daypack also had lockable zippers in addition to the main compartment, though. Osprey makes some good looking bags. It’s not easy to find stylish backpacks but theirs are sleek and chic and don’t look like your typical rucksack backpacks. They offer nice colors (or neutrals if you’re like me) and they won’t cramp your style. Whether you’re a backpacker, flashpacker, traveler, or tourist, you’ll look good in a Farpoint Osprey pack. I only have one tiny gripe with Farpoint Osprey packs. After only a few months, the back corners of the bag that have regular fabric not nylon, showed general wear and tear after only a few months unlike the Osprey Aura 65 that didn’t even show a scratch after using it for over a year. However, the fabric doesn’t interfere with the functionality so it wouldn’t deter me from recommending Farpoint Osprey pack and buying one again. Treat your Farpoint Osprey packs well and get a backpack rain cover. While it may not make it 100% waterproof, it will keep it clean and prevent your belongings from getting completely soaked when you put your bag on a wet or dirty floor. So if I love my Osprey packs so much, why am I getting a new one? Basically, after getting rear ended while driving in 2009 my back has only gotten worse so I’m now in the market for a wheeled backpack and have my eye on the Osprey Meridian 22. You have to remove the daypack to use Farpoint Osprey packs as a carry-on. While most travelers confirm they can use this bag to travel carry-on it may not work for budget airlines with smaller size limitations. Please double check with your airlines. The Farpoint 40 is slightly shorter at 21 inches which is a good alternative (it just doesn’t have the day pack but you can buy one separately if needed). 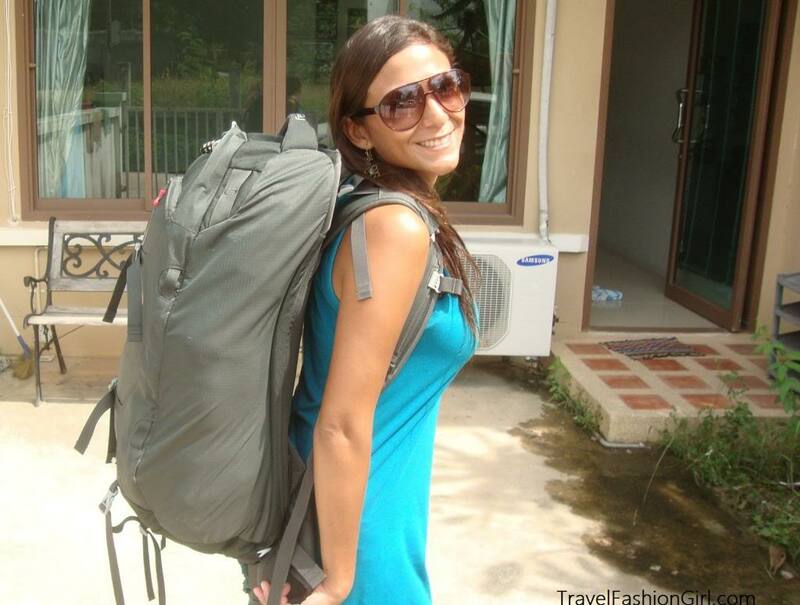 Please read this article to learn about How to Choose a Travel Backpack. What’s your favorite travel backpack? 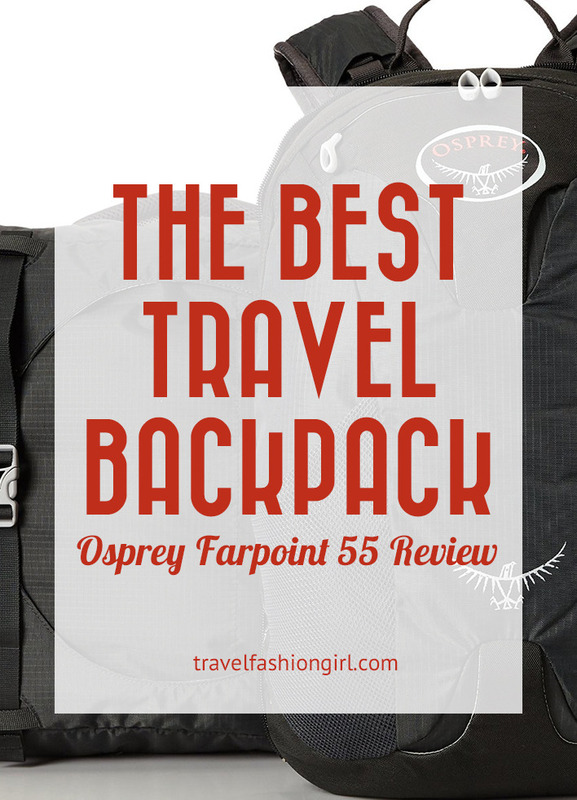 Have you used any Farpoint Osprey packs? Share in the comments! Best Osprey Backpacks: 4 Compared Which Makes the Cut? Hopefully you enjoyed these tips on Farpoint Osprey packs and how to clean your travel backpack. Please share these tips with your friends on Facebook, Pinterest, and Twitter. Thanks for reading! Hi you say you use your bag as carry on. Are you able to with the 55l bag? I thought the 40l was the max based on most airlines measurements? Hello! I am planning to check a new Osprey pack for an international flight. I was wondering how best to protect the bag and the straps while sending it through the baggage process. Do you have any tips or resources for this? Hi, I am planning a five month trip would you suggest the Farpoint 55 or 70? Hi Theresa, I used the 55 for 2 years full time travel 🙂 I’ve seen travelers with the 70 but it seems too large to carry comfortably. Thank you so much to share your priceless experience and information. Help me please! Which one is better as a carry on backpack? I would like to have carry on backpack without wheels! But I do not know which one is the best! I’m so tempted to get the Farpoint 55, but I’m afraid it might be too small! While it would be ample for my needs alone, we’re planning long-term travel with our two young kids who can’t really carry all of their own stuff yet. Do you recommend the small (30-40L) or medium (40-60L) rain cover for the sm/med Farpoint 55? 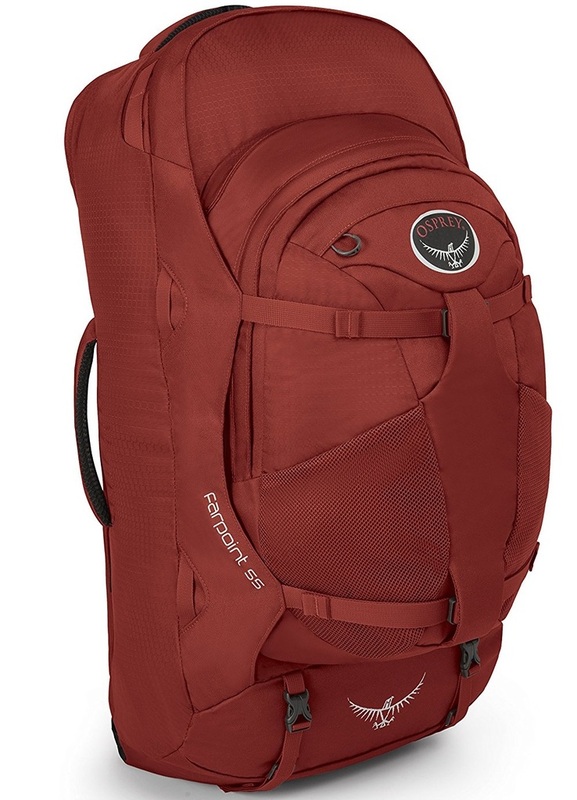 Just upgraded to the Osprey farpoint 55 for an upcoming trip through Eastern Europe. Thanks for the thorough review! It helped me narrow down my choices before doing a ‘try on’ session at REI. Did you use the official rain cover, or will any Large sized backpack rain cover fit comfortably? Thanks! Just to let you know that they have updated the bag and the day pack now comes with lockable zips like the main bag. I’m 4ft 11inchs so can’t take more than 55l so hopefully will be able to pack everything I need in it! Hi, there! Thanks for your detailed information. It helped a lot! But I am still thinking between aura 65 and farpoint 55. I will be traveling South America for 3 months and I think I will buy several small souvenirs. I am afraid if 40L is too small for packing all the things for 3 months including my laptop and DSLR. Do you think farpoint 55 is enough for three months trip, or do you rather recommend aura 65 since it has more space? Hi Jeong-Min, I traveled many years with a 40L so I think you can do it in 3 months 😉 Have fun! I recently purchased the Farpoint 55 but now I’m worried it’s too tall for me. The hipbelt and shoulder straps all sit where they should, but the top of the pack comes up pretty high on my head – most of it’s the handle so it’s not like it’s a lot of weight pulling backwards but I’m still concerned. I’m 5ft adn 110 pounds? Hi there! I’m 5’2″ and 112lb didn’t have an issue with it, but I never really used the hip belt or chest clip. What size did you buy? I had a small/medium. Do a test run, fill it up and try carrying it for 15 minutes. If not, you can always buy a teen or junior size backpack – this helps for smaller frames PLUS they tend to be a bit cheaper, too! 1. I am 5’5 and 110 lbs. Do you recommend the s/m or m/l? 2. I’m traveling carry on only (Jordan, Israel, Spain, Switzerland, Belarus). Have you had any trouble with this bag meeting the size requirements when flying in these countries? 3. Is there a safe and accessible laptop compartment? Thank you so much! I love all your advice! 3. 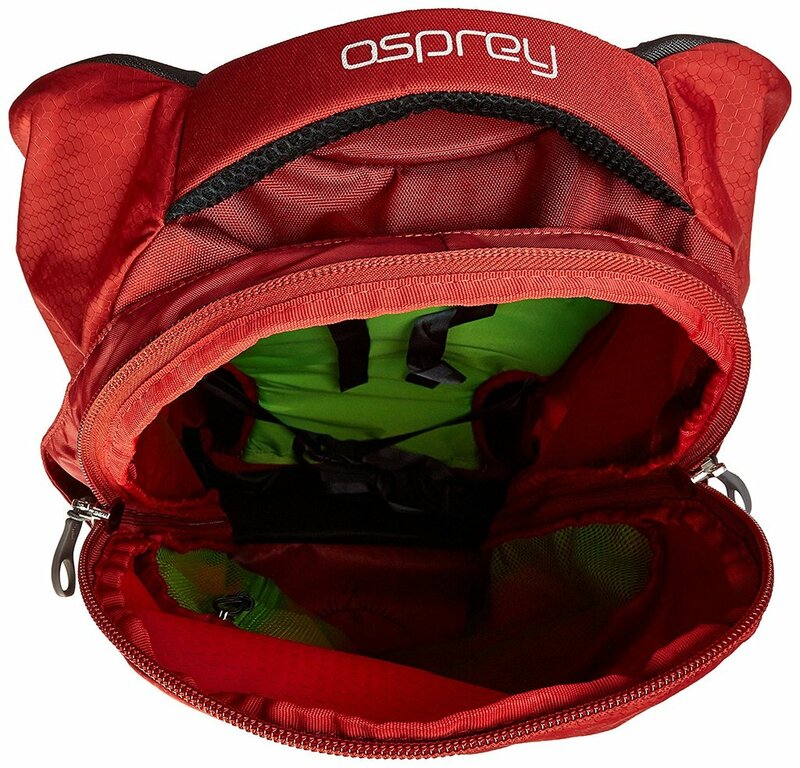 There is a laptop compartment in the detachable daypack. However, it does not have locking zippers like the main bag does. So, am I being a daft idiot when I say that I am kind of disappointed by this Osprey bag as it does not give me even one outside pocket/compartment? 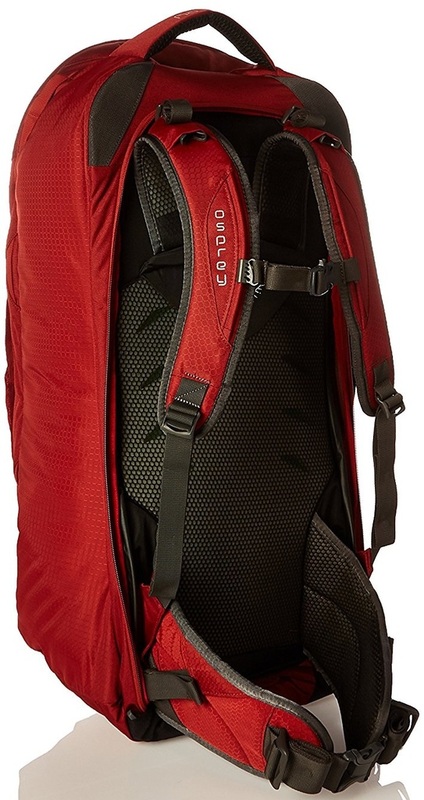 As compared to http://www.quechua.co.uk/symbium-access-70-10-backpack-id_27010-id2_8300991, this Osprey is nearly $50 expensive. I am thinking of giving this up on eBay and get another. Was my choice wrong? I need reassurances, TravelFashionGirl. Hello, 40 is too small for me. My concern is the total lack of pockets in this otherwise awesomely comfortable bag! It is just like a sack! You would be surprised how much you can fit in it! And strategic packing will get you far! Love this bag for all my travels! Hi Alex! Thank you for all of your tips, they are truly helpful! My concern right now is a carry on luggage. Did you take your osprey aura 65 as a carry on? And did you ever use your osprey meridian 22? I currently bought the meredian because I read great reviews but I want it as carry on for those low budget airlines. One person said all she does is detach the wheels prior to the airport to make it in the Ryanair airports. If you have any further advice I would love to hear it regarding taking the osprey as carry on. Thank you so much for your time! Hi Heather, thanks for your question! The Osprey Aura 65 was the first backpack I used prior to traveling carry-on only. This was a good bag but I used it before I began my quest to travel light. The Meridian 22 is carry-on for most international airlines but not Europe’s budget airlines like RyanAir and Easy Jet. Europe’s airlines have very strict limitations and the sizing is much smaller than US carry-on. If I’m using a 22″ like the Meridian in Europe (RyanAir or Easy Jet) I usually pre-pay the baggage check fee because I don’t want to risk it and get hit with a high penalty fee at the airport. Sometimes they’re relaxed and sometimes they’re strict but I don’t push my luck with them especially since the flights are pretty cheap I don’t mind as much paying a little extra for peace of mind. The 22″ size carry-on luggage works for me because it’s carry-on compliant on at least 85-95% of my annual flights and offers ample space for my long term travels. Let me know how it goes! Hi, did you try taking the wheels off and did it work to get it on budget airlines as carry on? Thinking about getting the meridian also, but that is my main concern! Hi Anisa! I didn’t take my wheels off but I do believe the Meridian would be too bulky for some budget airlines like Ryan Air or Easy Jet. If you book these flights far enough in advance they can be very cheap. I seldom use these airlines so if I find myself with the need to use them I just pre-book the 15 euro bag fee. Great post by the way! 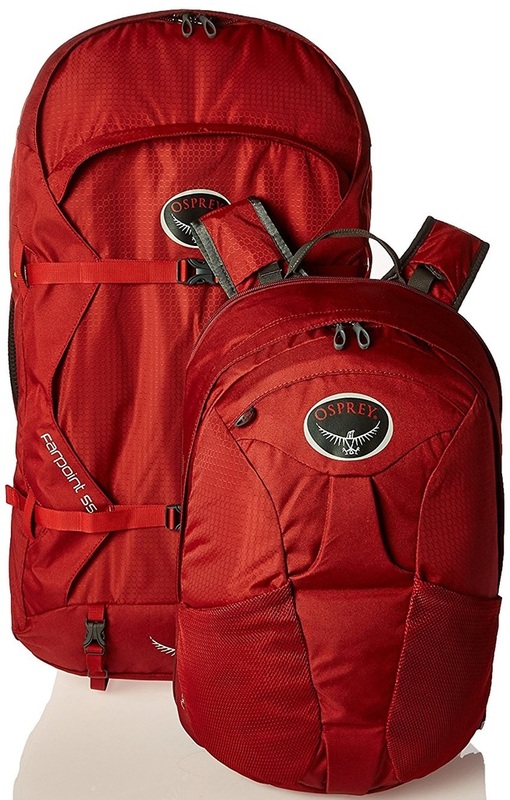 I have spent all arvo searching for the best womens travel backpack and a lot recommend the Osprey series. In your pic are you wearing the Osprey Aura or Fairpoint and what is the capacity? Hi Mel, glad you like the post! The backpack I’m wearing is the Farpoint with capacity 40L. The Farpoint 55 is basically one main bag (40L) plus one day bag (15L) totaling 55 Liters in space. Alex, which of the backpacks you mentioned above would be allowed as a carry-on? i would like to not have to check in any bags. Hi Melisa, the Farpoint used to be carry-on and it still might be on certain airlines. The Farpoint 55 is made up of two backpacks: one day pack that’s 15L and one main pack that’s 40L. The best thing is to check with your airline and determine the baggage restrictions before shopping as there are many changes going on with carry-on rules at the moment. What will work for one might not work for another airline. Hi Alex! I was wondering, have you flown Air NewZealand with your Farpoint 55? Were you able to carry on? I have the S/M which is 24x13x12 (49 total linear dimensions). Air New Zealand’s limit is 46.5 total linear inches and 15 lbs. I was thinking the height dimension is the variable I can play with, so I can use the compression straps to keep it under 9.5″ tall. I shouldn’t be cram packing it anyway if I’m trying to stay under 15 lbs. How much does your bag weigh? I think it would be helpful to list the weight of your packing examples (stuff in bags) for our reference. Hi Natalie, no I haven’t flown New Zealand. Do they charge to check your bag on an international flight? If your goal is to travel carry-o only to avoid fees, with all these new airline restrictions, it’s tough to say what works now and what doesn’t. Generally, international flights tend to be more lenient towards the dimension of your bag. Domestic travel is way more strict. However, if you get a free checked bag, why not check it if it’s a problem at the airport? My bag weighs about 12 kilos on average. Thanks! Hi! I’m a 5’10 female heading to Vietnam for 13 days. Should I get the s/m or m/l? Hi Marni, because of your height M/L seems like it would make the most sense but always double check with the manufacturer sizing information. Have a great trip! I have the Osprey Atmos 65 which is similar to the Aura and I love it even though it’s a top loader. I compartmentalize also using eBags cubes 🙂 and I also have a REI Flash 22 daypack. If I am checking in my pack, for security I use a Sea to Summit pack converter which weighs only 20oz and folds to nothing. I slide my entire pack into it and it’s waterproof, doubles up as a rain cover as well and has full zippers for lockability although this is more psychological than anything – zippers can be defeated in a few seconds using nothing more than a ball point pen (see various youtubes) LOL! Infact I would surmise that my system – which is a backpack inside a duffel, then zipped and locked is more secure than just a pack with zippers since it would take more time and draw more attention trying to undo 2 layers plus the duffel doesn’t really look interesting to thieves like a backpack or suitcase does. Just my theory! I keep virtually all of the stuff I need in the short term onhand in my daypack so it’s very seldom I need to open my main pack on the road… panel loading adds weight and the zippers can be a weak point. The Farpoint looks good. My last pack that I took around the world for 11 months was an Osprey Sojourn convertible pack similar to the Meridian. While it was a very nice pack it’s more of a suitcase than a backpack. I hated carrying it on my back as it just like I was strapping a suitcase to my back due to the heavy frame and the rigid bottom due to the wheels. Thanks for sharing this Kevin! It has worked as a carry-on on many international airlines but if you are flying on budget airlines within Europe, it won’t fit as they have very tight restrictions. In fact, it seems US airlines are now making their carry-on restrictions smaller as well. I am stuck between the two backpacks you discuss in this article! Like you, I am just over 5 feet tall and bought the S/M Farpoint 55L, and I find the frame hitting the back of my head, making it difficult to tilt my neck back at all. Based on your photo, it doesn’t look like this was a problem for you? I’m wondering if you configured your straps a certain way, and if this issue comes with the territory being petite (and would thus be the same with the Aura, or any other backpack, really). Did you find the frame to be a little high, and if so, how did you solve or live with the problem? What stops me from going for the Aura 65L is that it doesn’t open like a suitcase and I’m afraid of having to unpack & repack the whole thing every time I need something. Did you find this was the case? Hi Ala, at 5’2″ the Farpoint fit me better on the shoulders than the SM Aura but it also is preferable due to the zippered locks. I adjusted the straps and also had the bag fully filled. Alternatively, look for a child or teen backpack size in a different brand. The Aura like the Atmos opens up at the bottom as well, there is a removable divider. Between the upper and lower access points access is fairly easy to your stuff IF and this is a big IF you are organized well. Many people just jam everything into their pack… just having panel loading does not solve this. I have many times seen people open regular suitcases and hunting for stuff that is buried under mounds of stuff just stacked up. If you’re organized you will find your stuff easily whether it is in a suitcase or a top load, dual load or panel load. you’ll love it, I do! 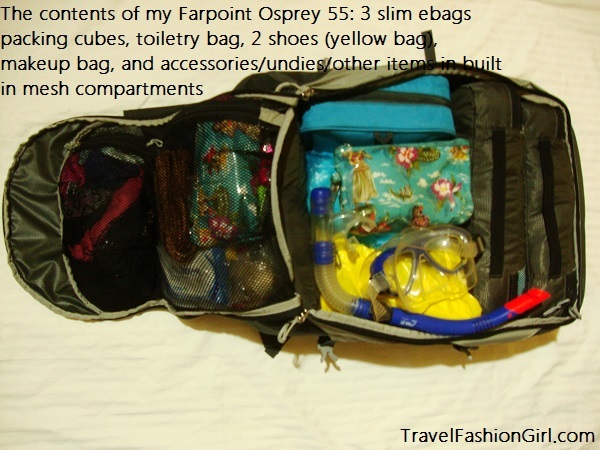 Useful review, what sizes of cube-packs that are suitable for osprey Farpoint 55? what brand of cube-packs do you recommend? Hi Claris, combined with 3 slim packing cubes you should have no problem fitting a maximista or minimalist packing list into your 55 bag with 38-40L of main bag space. I’m a full time traveler and thats what I use. Thanks! hello Claris! I had the same doub and question as you, 55 or 70 option to have more space? But I do not want something to big (1 month trip through South America) but if you have limited space. What choice did? 70 has more space but it’s too much space. I’ve seen female travelers with this size bag and it’s bigger than them. Does this backpack have straps that go around your waist to keep some of the weight off the shoulders?